Startled as she was, Alice was more frightened for him than for herself at the moment, and watched him with some anxiety as he mounted again. As soon as he was comfortably in the saddle, he began once more 'You're my--' but here another voice broke in 'Ahoy! Ahoy! Check!' and Alice looked round in some surprise for the new enemy. 'But you've got a bee-hive--or something like one--fastened to the saddle,' said Alice. 'Not very nice ALONE,' he interrupted, quite eagerly: 'but you've no idea what a difference it makes mixing it with other things--such as gunpowder and sealing-wax. And here I must leave you.' They had just come to the end of the wood. Of all the strange things that Alice saw in her journey Through The Looking-Glass, this was the one that she always remembered most clearly. Years afterwards she could bring the whole scene back again, as if it had been only yesterday--the mild blue eyes and kindly smile of the Knight--the setting sun gleaming through his hair, and shining on his armour in a blaze of light that quite dazzled her--the horse quietly moving about, with the reins hanging loose on his neck, cropping the grass at her feet--and the black shadows of the forest behind--all this she took in like a picture, as, with one hand shading her eyes, she leant against a tree, watching the strange pair, and listening, in a half dream, to the melancholy music of the song. 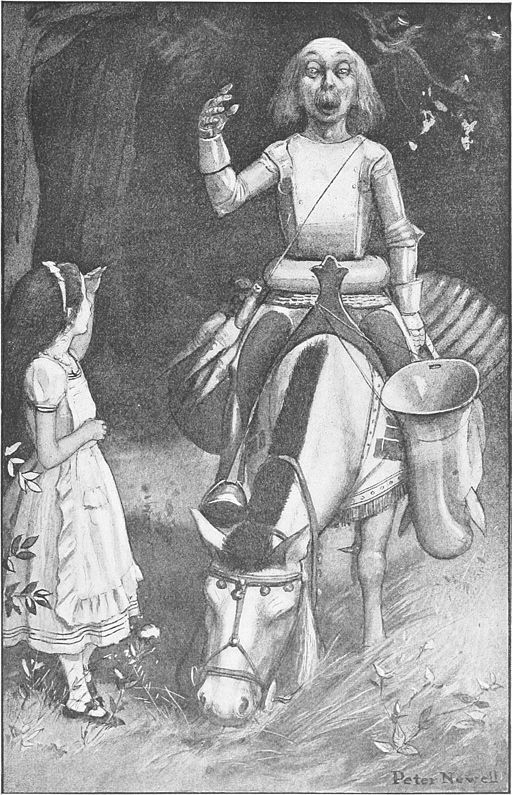 So they shook hands, and then the Knight rode slowly away into the forest. 'It won't take long to see him OFF, I expect,' Alice said to herself, as she stood watching him. 'There he goes! Right on his head as usual! However, he gets on again pretty easily--that comes of having so many things hung round the horse--' So she went on talking to herself, as she watched the horse walking leisurely along the road, and the Knight tumbling off, first on one side and then on the other. After the fourth or fifth tumble he reached the turn, and then she waved her handkerchief to him, and waited till he was out of sight.